Get your free DAPA packet and stay up to date on all the latest DAPA contracting information. Our DAPA packet is an informative collection of articles and information designed to help you get a head-start on the contracting competition. What is DAPA (Distribution and Pricing Agreement? Since the early 1990’s, the Federal Government implemented a Prime Vendor Program for brand name specific and generic medical material and supplies. A prime vendor is a business concern that functions as a purchaser’s primary source for specified classes of products and is responsible for the delivery of goods produced by various suppliers to the customer. The United States has been divided into twenty-two regions, with one prime vendor for pharmaceutical items and one prime vendor for medical/surgical items, delivering commercial products to all ordering facilities within that region. As part of the Prime Vendor Program, Distribution and Pricing Agreements (DAPA) are established with pharmaceutical and medical/surgical manufacturers and distributors. Under the DAPA, the agreement holder consents to allow the prime vendor to distribute its products to the ordering facilities and agrees that the prime vendor will be charged the same price as established in the agreement. Currently, there are approximately 29,000 items on DAPA for pharmaceutical items and approximately 118,000 items on DAPA for medical/surgical items. DAPA-Holder’s products to DLA Troop Support’s military and other federal customers. bag”. PREPACs may only be ordered by the MTF for which it has been designed. 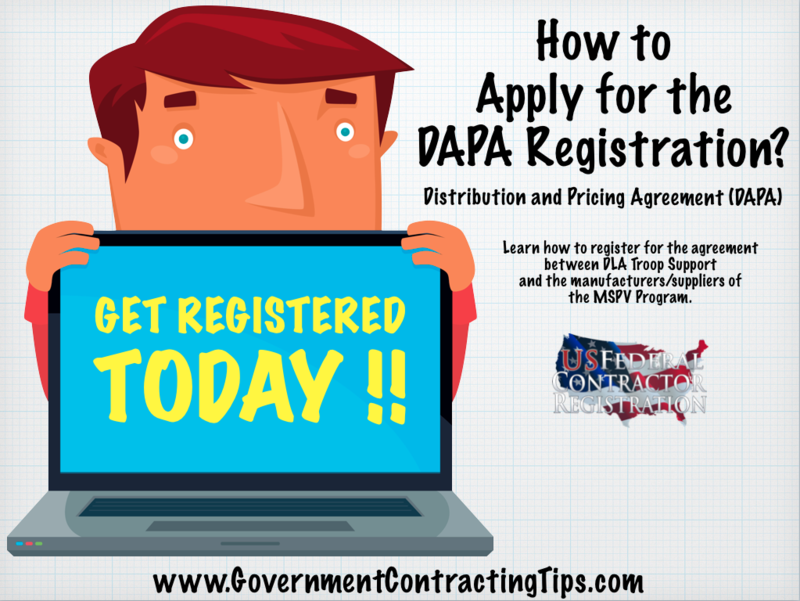 US Federal Contractor Registration provides DAPA registration technical support. To learn more about DAPA called their Contractor Helpline at 877-252-2700 Ext 1.